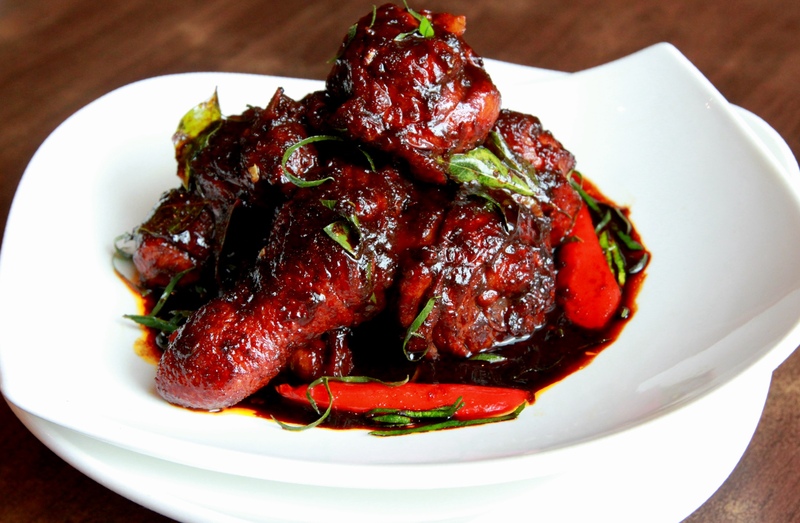 Chef Rram’s Chicken Kala is a famous dish in Penang and compliments other dishes when having Nasi Kandar. Chef Rram is the Indian speciality chef at The Resort Café, Sunway Resort Hotel & Spa. Marinate the chicken with all the ingredients and keep aside for 20 mins and then deep-fry. Heat the pan with oil and add star anise, cinnamon, cardamom, bay leaves, curry leaves followed by mixed fenugreek (halba campur). Sauté for a while and then add minced shallot, garlic, ginger and fry for awhile until golden brown. Add the chilli boh and fry for a few minutes. At this point reduce the flame and add both the curry meat powder and curry powder. Add a little water and cook until it becomes a thick paste. Add the fried chicken followed by chilli sauce, chopped tomatoes, green chili, coriander and lime leaf. Lastly season with salt and sesame seed.